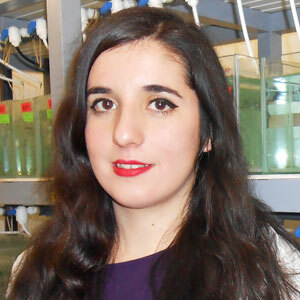 Ana Quelle Regaldie obtained her degree in biology from the University of A Coruña in 2014, where her final degree project was done in the department of cellular biology about the neuroanatomy of the zebrafish, under the supervision of Dr. Julián Yañez. During her degree she did an Erasmus stay at “Università degli studi di Padova” (Italy). In 2015, she completed a Master on Biomedical Research at the University of Santiago de Compostela. She carried out her master´s degree project at the “Galician Public Foundation of Genomic Medicine” in the laboratory of Neurogenetics under the supervision of Dra. María Jesús Sobrido, Dra. Beatriz Quintáns and Dr. Ángel Carracedo.